We all know that businesses across the globe have used sign boards to display different kind of messages and brand related slogans in order to attract those passing by their stores and to create and increase Brand awareness in the market. In today’s time many businesses Are using different tactics To promote the businesses With the help of outdoor LED signs in order to attract new and potential buyers and to distract their attention from the competitors in the market by either talking about the brand or by highlighting a new product in the store. Outdoor LED signs are one of the most effective and efficient ways of increasing the number of footfalls in your store. There are also a great way to advertise your business. They have a large number of benefits to offer and hands are widely used across Dubai. These bright signage can be easily seen even during the daylight and during the night time. No other signage has the Potential to attract the crowds in the market as compare to that of outdoor LED signs. Make sure you choose the right outdoor advertising agency in Dubai for your store signage. We bring to you some of the unique ways in which businesses in today’s time are leveraging the use of outdoor LED screens or signs in order to increase their business and sales. Did you know that outdoor LED science can be actually used in order to offer real-time information to the customers and those passing by the store? The fact is that you can do so instantly through an LED screen. This helps in making a brand appear more dynamic As compared to that when using a static or a standard Billboard. Most of the retail businesses and their owners in Dubai are now making use of LED sign to display different types of content on the signs. This eventually has helped most businesses to effectively and efficiently promote businesses and to showcase the product to different potential customers. 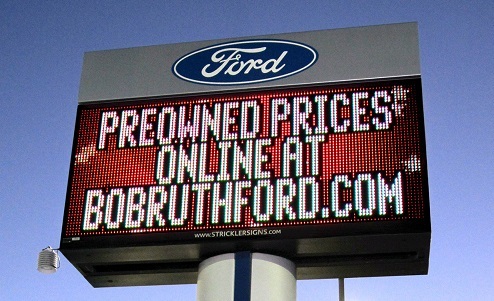 You cannot deny the fact that outdoor LED signs are extremely attractive and appealing. These visually impressive signs are now a days also used in order to engage with potential buyers through some entertainment. For instance events such as basketball, tennis table tennis etc. can now be displayed with the help of outdoor LED signage. This is usually quite beneficial for all hospitals who are using outdoor LED signs. These signs can tell people the average amount of time that they have to wait. This also eventually helps patient to receive immediate medical care during emergencies. We hope this blog was a good read for you! These were some of the amazing unique ways and advantages businesses can have when using outdoor LED signs. To know about some of the finest signage advertising services in Dubai advertising services in Dubai, click here.